Largest online selection of OEM designed and built industrial propane and natural gas single phase generators. 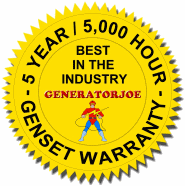 25,000 watts (25 kW) to 350,000 watts (350 kW). Engines from GM & PSI.